Give our original confections, made the same way for 98 years! The blossom-fresh flavor of crisp Washington apples, the tangy goodness of ripe apricots, and the nutty richness of crunchy walnuts have made our namesake Aplets & Cotlets our top seller since 1920. We slow-simmer the ingredients to create a smooth, gently chewy texture to our candies that's impossible to resist! We still do most everything by hand, just like when we began making our famous candies, so you can taste the nostalgia in every bite. Kosher. INGREDIENTS: sugar, corn syrup, walnuts, modified corn starch, fruit juice from concentrate (apple, apricot), pectin (pectin, disodium diphosphate, sodium polyphosphate, dextrose, dicalcium phosphate), natural flavors, sodium citrate, citric acid, malic acid, soy lecithin. My favorite candy of all time! Aplets and Cotlets have been a staple in our family since I was a kid in the 1970's. They were a favorite then and are even more so now! They are so addictive, I can't stop eating them so it's a good thing I can't buy them locally, lol. Our son is now as addicted as I am, but his faves are the Fruit Delights. I like them as well! So glad this company is still around to satisfy my sweet tooth! We cannot let Christmas go by without getting Aplets and Cotlets. I can remember Aplets and Cotlets from when I was quite young. It wasn't until the Internet that it was easy to find them in the Midwest. My mom, even when she had quite a lot of dementia, did not forget to ask us to order her a box of Aplets and Cotlets. We have introduced them to many friends over the years and everyone loves them! I first "discovered" Aplets and Cotlets back in the early '70s, when my brother and I used to take them along on backpacking trips. I still love them, and could eat them all day! During World War II, in the early 1940's, we used to take the Coast Daylight train from Los Angeles to San Francisco, when my father got shore leave in San Fran. On the train, a snack and candy salesman would push a cart through the many train cars, and would be giving out free samples of Aplets and Cotlets, in hopes the travelers would buy a box. My brother and I would wait impatiently for him to come to our car, so we could get our free sample. I begged my mom to buy a box, but she never had the extra money. When I was a teenager, I took the Shasta Daylight to Seattle, and there he was, the same man, still selling the candy and giving out free samples! Years later when I was grown up, I happened to see a box for sale at a department store! I think it was Bullocks? I was thrilled to see the candy after all those years! I bought a box, and have been buying them ever since! Delicious candy, and wonderful memories! Once good, now just AWFUL! My favorite Christmas candy for 20+ years, either changed, or we got a terrible box. It tasted like perfume or something strange. They are just awful now! Received our sample box quickly. Tasted and so good. Will definitely be buying and giving for holidays! Oh how I love and enjoy the fruit and nut candies! DIDN'T KNOW WHAT TO EXPECT AS I'D NEVER EATEN A COPLET. DIDN'T LIKE IT AT ALL! I GAVE THE REST TO MY SON'S GIRLFRIEND AND SHE DIDN'T LIKE IT EITHER. I HAD BEEN LOOKING FORWARD TO RECEIVING MY CANDY SUPPLY AND KIND OF SPEECHLESS AT MY RESPONSE. I HAD BEEN BUYING "MISTAKE" TRUFFLES IN GEORGIA AND WAS HOPING I HAD FOUND A CANDY SUPPLIER CLOSER TO HOME. I've ordered numerous times from Liberty Orchards. The Cotlets are our favorites. As always, the order process is flawless and the candy outstanding ! My Dad used to buy these for all of us at Christmas. This year, I surprised him by buying a box for him and my mom. They were so completely delighted and said they were still the best and as delicious as ever! So nice that some things never change. I ordered the free sample and received both Aplets & Cotlets and Fruit Delights. I was sent more than I expected and I thoroughly enjoyed the sweet treats. I will definitely be purchasing more in the future and am eager to try the other flavors, too. Aplets and Cotlets have been my favorite candy since childhood, and continue to be. And now I'm a Grandma! I grew up eating these with my grandma. I absolutely love that i can now share them with my children and soon my grandchildren!! Thank you!!! Can't eat just one !!! This product is awesomeness !!!! I bought a box with 72 pcs and almost ate them all !!! I haven't ordered any in a little while but when I did order and receive them they were just like I tasted years ago. GREAT PRODUCT!!! I stumbled upon this site last year after searching for "Turkish Delights." Much like some of the other reviewers, I wanted to taste what Edward in the Lion, the Witch, and the Wardrobe fell head over heels for. I love this candy. They're delicious -- soft, fruity, and sweet. Plus their shelf life is 6 months, which is good news for slow snackers like me. Perfect refreshments when you have guests over. I just sent $40 worth of aplets and cotlets back to Amazon. Like other reviewers have said, the recipe has changed. There are hardly any walnuts. Just a sliver in some pieces and none in others. Now you sell an "extra nut" variety. Is that your way of making us pay more for what we used to get? I also don't notice any flavor difference between the apples and apricot pieces. It all looks and tastes the same. Shame on you for changing! Bought 3 boxes for gifts. Received seconds, inferior product. Some with no nuts, rest with little. Irregular shapes. Should be advertised as "seconds". They were better when purchased at CVS! "What is unusual, is that now, over 90 years later, we still make our candies by the same time honored methods, using the same secret family recipe." I am 77 years old and have been eating aplets & cotlets all my life. When I still occasionally buy them, I always miss the actual original aplets and cotlets. Since we had them as a very special treat when I was a child, I remember that the original recipes were richer and the ingredients more natural and satisfying. When I look at the current ingredients, I wonder about the corn syrup, chemicals, and "natural flavors." Aplets and Cotlets are delicious! We received a box of Aplets and Cotlets from our friends in Creswell, OR, for Christmas. Absolutely delicious candies! I would highly recommend Aplets and Cotlets to others. Just ordered three more boxes of your wonderful candies. This confection surpasses any candy available in the marketplace. It tastes fresh and delicious because the company uses wholesome ingredients and doesn't cut corners with cheap substitutions. Absolutely addictive. Product was stale, lacked nuts, and pieces were very irregularly shaped. I tried the aplets and cotlets for the first time and I must say they're delicious! The apple and apricot flavor is on point but only one criticism, not enough nuts. When I bite into them, I can only taste the soft texture of the candy. I can barely taste the crunchy texture of the walnuts. Overall, the candies were superb. The Aplets & Cotles are delicious. Wonderful choice. You have me addicted. The Aplets & Cotlets were absolutely delicious. You have me addicted!!!!! Where did the nuts go? Received these as a gift. They were not like what is pictured on the box. Very few nuts and some pieces didn't have any nuts at all. Not what I remember from when I lived in Washington. I am originally from WA and I miss Aplets and Cotlets, WA too! I remember when my mom and I toured the factory when I was a little girl, a memory I will never forget! These are the BEST sweets you will ever have. Neighbors brought be a box as thank you for pet sitting. I'm hooked! I ordered a 48 piece box for me. Just ordered a bunch more to take to work and share. Never had candy like this before! Estimados senores, Quisieramos saber en Colombia donde podemos conseguir sus productos. Cordial saludo, Liliana. I love Aplets and Cotlets, but I must agree with other comments that you need to use more nuts. Otherwise, it's just fruit jelly. The nuts are what make them special. Still wonderful after all these years! Liberty Orchards never disappoints! 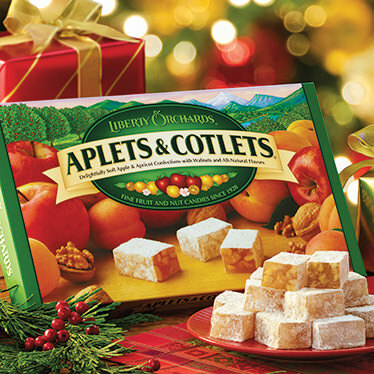 Ever since I was a kid I have loved Aplets & Cotlets; it wouldn't be the holidays without them! Now that I know they have so many other items to choose from, I intend to try them all! I mean, Turkish Delight?!? Definitely at the top of my list. I'm so glad you're still around. I lived in the West where Liberty products sold more. So thrilled when I saw this product on shelves here in South. Haven't had since early 90's. What a dissapointment. You could hardly tell the aplets from the cotlets. Used to have more intense fruit flavor. And, nuts so much less. Sad they felt they had to change for profit. When, people will pay for quality. Will never purchase again. Not the same product. Liberty Orchards Reply: Deborah, we're very sorry you didn't have a satisfactory experience with our products. We want you to know that we have not changed the recipe for Aplets & Cotlets since 1972, with one exception. All the flavorings are exactly the same, and used in the same proportion. The single exception is that the amount of nuts will vary a little from year to year, depending on walnut pricing. This past year, due to a 50% increase in walnut costs, we reduced the amount of nuts in the recipe by about 5%. With a little lower pricing this year, we are returning to prior amount of nuts in the recipe. One of our customer service staff will be contacting your shortly to make things right with you. Aplets and Cotlets, they're classic candy is so good, so addictive - I cannot keep them in the house. I love to share them with friends and family though as gifts. I highly recommend them. Was so proud to visit them in Washington. Enjoy the Aplets & Cotlets candy. It is always good and tasteful. We purchase the candy at the Apple Barn in Pigeon Forge, Tn each time we visit the City. They are the best candy out there! Never disappoints! Would highly recommend to anyone. We got a box for a gift, had never heard of them before and wanted to get them to have an alternative to chocolate. Was going to have only one or two a day, but they were too good and didn't last! Never tasted anything like it and absolutely love it! I get these at Christmas time as a special treat. And treat they are. They have a delicious light flavor! Kind friends in Washington state sent us Aplets and Cotlets, knowing how much we've enjoyed them on visits to the USA. I don't care if it costs a lot to post them.... they're great and there's nothing similar in the UK. Our household doesn't see what the fuss is about - these candies are bland and boring. i bought a box of 4 kinds of your jellied candies at Family Dollar store and just bought some aplets and cotlets from Walgreens drug store. 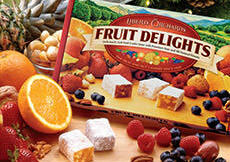 Are these the type of candy used in the movie The Chronicles of Narnia...Turkish Delights they called them? They are very good and i was gonna make some until i found yours. You guys keep making them. I could eat a whole box at one sitting. I would like to taste everything you have!!! God bless you all, miss dotty Liberty Orchards Reply: Yes, our candies are based on Turkish Delight, or Locoum, as the confection is known in the Eastern Mediterranean. And yes, this is the confection the Witch used to lure Edward in the Chronicles of Narnia! A&C No nuts, Extra nuts, & Regular -- Wow! Although these are excellent,to me the berries are even better. I like the nuts and think I should get the A&C with extra ones for me as well. I have a friend, a beloved widowed professor many years my senior, a "second mother" that I visit from time to time for her help with ancient languages. She is very old but her mind is sharp. Every year I give her a box of A&C. 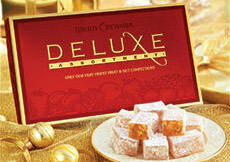 This year I could not find A&C locally as usual and gave her another brand of Turkish Delights. She gently remindend me that I could get the Liberty Orchard ones on line or just call Liberty and order over the phone--hint taken. These are her favorites, but she has been having a hard time with the nuts lately. So for her, your new nut free version should be perfect -- You Liberty folks sure do think of everything! Thanks. PS I appreciate that they are Kosher too. This is my absolutely favorite candy in the whole world!I can never decide which is more delicious, the Aplets or the Cotlets - and I just tried the pineapple macadamia nut fruit delights....wow. Soooo good! Very fresh, and this does make all the difference, so I will be buying them directly from you now! I have an immense sweet tooth and my husband decidedly does not, yet we both enjoy these; and our kids will clean their room for a piece. I would very much like to have the option to purchase single flavors in bulk (by the pound!) as well. So good! I had looked everywhere for Turkish Dekight! (in the US called Aplets and Cotlets)Finally on Liberty Orchards website, I found what I had been searching for!! The taste and texture is excellent! This is exactly what I had been looking for! I've never tasted candy this good before! I've bought it many times (along with other Liberty Orchards products) and will continue! A friend gave me my first box of Aplets & Cotlets and I loved them. I cannot have chocolate and was so pleasantly surprised that these were a great replacement. We love Aplets & Cotlets! They are so fresh and natural tasting. My mother gave my husband & me a box, and we are addicted and are buying boxes for our relatives. We definitely recommend them. I accidentally tried your product that someone received for Christmas. I ordered for my husband and I and my teenager even likes them. Its so nice to eat something sweet and satisfying low in fat and filled with the goodnes of fruit and nuts. Bravo! We love it all. Have been enjoying this product for over 35 years. Have had the traditional type and the bars which are great for traveling. Don't change a thing. I was introduced to Aplets and Cotlets just about 60 years ago and loved them dearly. They became a Christmas staple of our family and are as smooth and tangy today as they were "way back when". Now my gradchildren look forward to the treat. Your Aplets and Cotlets are awesome and top quality. My Aunt is gluten intolerant, and these are about the only festive food that I can send her. Even most chocolate candies have gluten in them, so thanks for keeping the gluten out and the yummy in! My wife loves Aplets and Cotlets!!! I'm always a hero when they arrive, especially when I just order them out of the blue! Highly Recommended - I've been giving Aplets & Cotlets as gifts for years, and will continue to do so because everyone loves receiving them. Excellent quality; excellent service, except we did not hear back from you, as promised, about when shipping had been done. I had to call your company to be sure it had been delivered. Thank you for making our Christmas merrier! Your product arrived so promptly and so very fresh. The boxing ensures freshness. Keep it up. 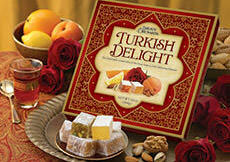 I recently ordered a variety of "Turkish Delight" for our Narnia party. I got a variety pack, and I was pleasantly surprised just how good the original Aplets were...they truly taste like "fairy food". I liked all the flavors (Aplets and Cotlets, Berry Delights, Fruit Delights and Locuom), but I think that the Aplets are my favorites! Love this candy. My husband has had it before and just got some for me and I love it. Good job. Thanks. Have a good day! Your Aplets and Cotlets are absolutely excellent! They have a refreshing fruit and nut taste without being too rich or sugary. I am giving them as gifts this year to our friends. I've just tried my aplets & cotlets sample, and only 1 tasted delicious and the other three tasted like cough syrup. Was the delicious one aplet and the nasty ones cotlets? The problem might be that I don't like jellies. the product is; as Dennis T Mennace says "SCRUMPTDELICIOUS" You can't eat just one. They are THAT GOOD!! I remember Aplets & Cotlets from my childhood. Originally, my family received them as holiday gifts. Later, my mother would give them to me as a holiday treat. I could understand how the White Witch seduced Edmund with Turkish Delights. I prefer Aplets & Cotlets to all Turkish Delights other than the Locoum. I bought these bars in Ocean Shores, Washington and loved them first bite. All the different flavors are really good. You should change the description from "with walnuts" to "with walnut", as in singular walnut. In the past there were MANY MORE walnuts in Aplets & Cotlets. Now it is "jelled flavored sugar" with a few miniscule walnut grains. The walnuts were what made these so good. Won't be buying them again. 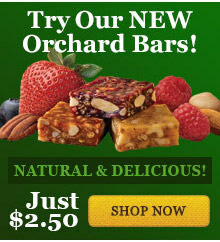 LIBERTY ORCHARDS RESPONSE: Sandy, we're very sorry you had this experience with our product. Our recipe calls for a big helping of nuts in every batch, so each piece of candy should have a few pieces of nut. However, when we mix the nuts into the hot jelly, the nuts tend to float. So sometimes, the top trays of poured product will be "nut-heavy", and the last trays "nut-light". We have methods for correcting this, but they're not fool-proof. Your review prompts us to keep looking for better approaches. Thanks again for writing. Jun 28, 2010 | By Melanie B. The best stuff I've ever tasted. Bought some at a store one Christmas and it blew my mind. Couldn't find it there after that so I went online and now I'm a happy, happy girl! YUMM! Aplets and Cotlets get harder and dried out too quickly once opened - or the box doesn't do a good job or keeping them fresh. Liberty Orchards Reply: Lewis... Thanks for your comment. Yes, "drying out" is a problem with Aplets & Cotlets. Our confections are moist when fresh, so once the package is opened, they will tend to dry out, just like any fresh bakery product. You can extend the product life by closing the lid, wrapping in Saran or Glad, and putting in the refrigerator. At our factory, we keep the packaged product in cold storage until it's ready to ship, and this helps to keep the product fresh. Have been eating Aplets and Cotlets for more than 60 years, having first experienced these treats when they were sold on the Southern Pacific Daylight train from LA to SF. They are still my favorite treats. For many years we enjoyed your product but for several years I have not seen it locally so I went online and purchased four boxes. The A & C were fresh but where the nuts? My recollection, and others who ate the candy, was that you have scrimped on the nuts. Disappointing. Liberty Orchards Reply: Thank you for your feedback. We're sorry that you didn't feel there were enough nuts in the product. I want you to know that we have not changed the amount of nuts in the recipes for many decades. However, while we mix the nuts into the fruit-base very thoroughly, we do experience some variation in the distribution of nuts in the finished product. Some pieces and boxes will have a bit more nuts, some a bit less. I haven't bought this product for a good number of years. Bought a 9 oz box the other day and was disappointed in the lack of walnuts in the product. I remember the mix of walnuts with the apple and apricot flavor was really good, but could barely tell there were any walnuts in the candy this time. Won't be buying it again, unless this changes (and I somehow find out about it). Hope you decide to add more walnuts back in! Liberty Orchards Reply: Thanks for your comments, Sandy. We're sorry that your Aplets & Cotlets didn't have enough walnuts. We agree with you that there should be plenty of walnuts in our candies. We want you to know that we have not changed the amount of walnuts in our product for decades. However, hard as we try, we don't get perfect mixing of the nuts with the fruit jel. In the cooking kettle, the nuts tend to float to the top, so even though we're mixing them back in, some trays of candy will have a bit more nuts, and some a bit less. Also, in pouring the hot, cooked product into slabs for cutting, there will be portions that have more nuts, and some that have less. We don't mean to be making excuses here. You have the right to expect excellent products from us, and we'll keep trying to do our best. The Aplets and Cotlets are very good but not my favorite product from Liberty Orchards. I find them a bit boring and prefer the sparklers. I have been enjoying these fine candies for years. They are one of the only products available here from Liberty Orchards. I pick up a box a few times each year to snack on them. These are a real treat. When my daughter was in gradeschool we read "The Lion, the Witch and the Wardrobe." We found this candy at that time, almost 20 years ago, and shared several boxes with her entire fourth-grade class. I had been looking everywhere for the "Turkish Delight" mentioned in the book. The Aplets and Cotlets have been a favorite ever since -- especially during the holilday season. They provide a happy memory every time we enjoy them. We received a box of Aplets & Cotlets for Christmas. They're one of my favorite treats!I first had them more than 40 years ago.My Father bought them often because they were his favorites,too. Thanks for a consistently delicious product! Wonderful sweet, but just right and light... good stuff. Have had these since I was a child and they have become a family favorite. They remind me of the delicate candies we had in Europe, like Turkish delight, which was mentioned in the movie Narnia by C.S.Lewis. So when the children sit and watch the movie during Christmas they each get a few of these delightful candies. Make a memory. My mother grew up in Bothell, Washington and her favorite candy is Aplets & Cotlets. She moved to Ohio in 1943 and we (her son and daughter) have enjoyed them since 1943... and Mom since about 1936. I buy 10 to 15 boxes every Christmas time here in Ohio. I first tasted your product in Zimbabwe Africa. a gift sent to my Mother (Viola (Mabie) Wilkins) She grew up in Monitor Washington, and went to high school in Cashmere. Her Father ran an apple orchard in Monitor. She then went to Zimbabwe in 1940 as a Missionary, and passed away there at the age of 93. I came to live with my brother and his wife here in Texas in 2008. Yesterday I was in Ross San Antonio and found 2 boxes of your delicious product. I just want to say thank you for making such a delicious candy, also a lovely reminder of my Mother. God Bless you, K Anne Wilkins. I was given some Aplets and Cotlets years ago from relatives from Cashmere. They were delicious. I was thrilled when I found your website. I just put in a big order for Christmas gifts and of course, myself. Keep up the good work! While I like Cotlets, my preference is Aplets..1st tasted over 20 years ago!..hoped to find the availability to order those alone & don't see it in my most recent catalog & had REALLY planned on ordering these for several family members this year for Christmas...HELP!